Enchanted creature gets +2/+2 for each other enchantment in play. Hey, other than one aura, Ancestral Mask , your deck is setup to use Estrid as a Commander more than Tuvasa. Tuvasa is strongest when she's attacking doing Commander damage. What makes her powerful is she's both an enchantress and beat stick for Commander damage from the Command Zone. With Tuvasa as Commander consider low mana cost auras that can make her a real threat? Rancor , Ethereal Armor , Daybreak Coronet , Steel of the Godhead , Favor of the Overbeing , etc. Want to get enchantments onto the battlefield fast to pump Tuvasa, but this goes against the extensive pillowfort strategy. The pillowfort strategy with combos requires a lot resources and time to setup and that's in Estrid's wheelhouse not Tuvasa. Tuvasa can still benefit from some pillowfort cards such as Blind Obedience and Authority of the Consuls since these cards help to clear blockers for her to attack. Aura of Silence , Energy Flux , Stony Silence are also quite good since they shut down artifacts and artifacts aren't part of your strategy. 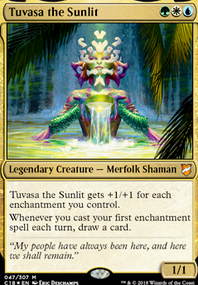 Tuvasa can also benefit, but much less than Estrid, from low mana cost land auras. 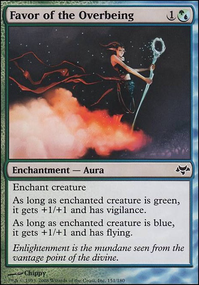 Unlike Estrid who wants all the land auras to take advantage of her +2, Tuvasa doesn't need them all, just the low mana cost ones that create ramp (Growth, Sprawl, Fertile). 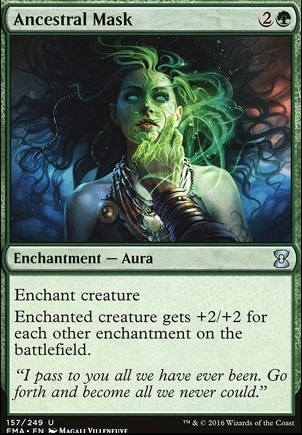 Many creatures are less needed when playing Tuvasa as Commander because she's the creature you want to focus on and enchant. All the other enchantresses as well as Sram, Senior Edificer and Kor Spiritdancer (aura enchantresses) and Heliod's Pilgrim are all the creatures you need. Rather than big creatures consider instead splashy cards that interact with auras/enchantments: Retether , Three Dreams , Wargate , Plea for Guidance , Aura Thief . UB delver in Modern lacks a few key components that make the Pauper version better: Gush , Foil , Counterspell , Brainstorm , Ponder , Preordain are non-modern legal. I think that the pauper-legal version is good enough to compete in modern, but cutting the above really hampers the deck to the point where it is no good. You should look into which deck in pauper has the least non-modern legal cards. The answers to this are few - Burn and Bogles are the first that come to mind, where you only really lose a few cards ( Chain Lightning and Fireblast for burn, Ancestral Mask and Armadillo Cloak for Bogles). I would suggest Ancestral Mask as a good aura to use. It quickly makes Karametra quite a threat. I've also found that auras like Wild Growth and Utopia Sprawl are good. In the early game, they help you get Karametra out faster. 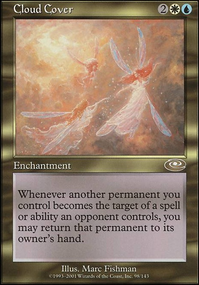 In the later game, they are pretty cheap draw triggers from your enchantresses. Here might be some cards that are budget and maybe of use! They should be under $2 at most! You can also take a look at this deck if you want a more voltron approach to gain some ideas!